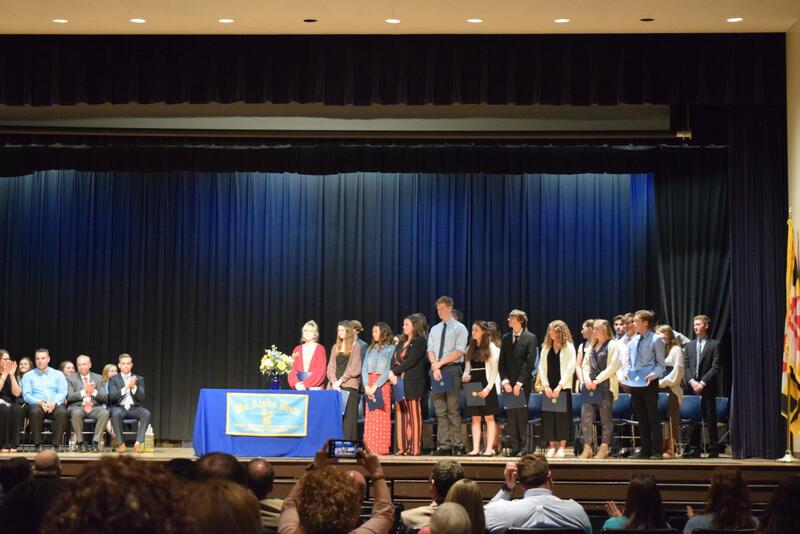 The new Mu Alpha Theta inductees. On April 9, 30 students were recognized for their excellence and rigor in their math courses. The ceremony was held at the Stephen Decatur High School Auditorium. In order to be inducted, students must be involved in an AP or Honors math class and maintain a 3.5 grade point average in their math courses. Mu Alpha Theta president Kevin Beck spoke during the ceremony. Following the inductions, Beck stated, “The ceremony went well, and I am proud of all who qualified and all who were inducted.” Mu Alpha Theta will also be sponsoring a fundraiser at Popeyes to raise money for their organization. They welcome everyone to come and support. Decatur alumni Jordan Cater, gave the new inductees and prior members many tips about their future in not only math, but life. Cater was a successful student athlete who also excelled in school, having been a former Mu Alpha Theta member. Junior Karsten St. Amant spoke about being recognized at the ceremony. He stated, “I am honored to be inducted into this program, all the long nights I stayed up doing my math homework paid off. Seeing my hard work being appreciated makes me proud.” St. Amant plans to take yet another rigorous math class during his senior year that enables him to be inducted again. The ceremony lasted a little less than an hour and went smoothly. It was a nice evening for all who attended and a proud moment for all the inductees. Mu Alpha Theta president gives speech to new inductees.